In her teen years, Leontyne accompanied the "second choir" at St. Paul's Methodist Church, sang and played for the chorus at the black high school, and earned extra money by singing for funerals and civic functions. Meanwhile, she often visited the home of Alexander and Elizabeth Chisholm, where Leontyne's aunt worked as a laundress. A wealthy white family connected to the largest lumber company in Laurel, the Chisholms encouraged Leontyne's piano playing and later singing, and sometimes hired her to entertain guests. During World War II, Leontyne worked part-time in the Chisholm household as a maid and baby-sitter, and was allowed to play the piano and to listen to music on the radio and record player. Mrs. Chisholm accompanied Leontyne in recitals and church appearances in and near Laurel, and later helped defray some of her college expenses. Aiming at first for a teaching career, Price enrolled in the music education program at the all-black Wilberforce College in Wilberforce, Ohio. (The institution's public and private arms split in her junior year and she graduated from the new, public Central State University.) Success in the glee club led to solos, and her teachers began to encourage her to pursue studies in voice. With the help of the Chisholms and the famous bass Paul Robeson, who put on a benefit concert for her (at which she also sang), she enrolled at the Juilliard School in New York City. She won a scholarship and was admitted to the studio of Florence Page Kimball, who would remain her principal teacher and advisor throughout the 1960s. Price is a member of Delta Sigma Theta. In the summer of 1951, she studied in the opera program at the Berkshire Music Center and sang the leading role in a production of Strauss' Ariadne auf Naxos (second cast), her first leading role. In early 1952 she was Mistress Ford in Juilliard student production of Verdi's Falstaff. Shortly thereafter, Virgil Thomson hired her for the revival of his all-black opera, Four Saints in Three Acts. After a two-week Broadway run, Saints went to Paris. Meanwhile, she had been cast as Bess in the Blevins Davis/Robert Breen revival of George Gershwin's Porgy and Bess, and returned from France in time to sing the opening night at the State Fair of Texas on June 9, 1952. The tour went on to Chicago, Pittsburgh, and Washington, D.C., and then Europe (Vienna, Berlin, London and Paris), sponsored by the U.S. State Department. On the eve of the European tour, Price married the noted bass-baritone William Warfield, the lead Porgy in the Davis-Breen production. The wedding was held at the Abyssinian Baptist Church in Harlem, with many of the cast in attendance. In a memoir, My Music and My Life, Warfield says their careers forced them apart. They were legally separated in 1967, and divorced in 1973. They had no children. At first, though excited about opera, Price discounted her chances and planned instead on a recital career. She used as a model the careers of Marian Anderson, tenor Roland Hayes, Warfield, and other successful black concert singers. Amid performances of Porgy, she sang the premiere of Hermit Songs, a song cycle by Samuel Barber, at the Library of Congress. She also premiered new works by Lou Harrison and John La Montaine. However, she had proved in "Porgy" that she had the voice and the personality for the operatic stage, and the Met itself recognized this by inviting her to sing "Summertime" at a "Met Jamboree" fund-raiser on April 6, 1953 at the Ritz Theater on Broadway. Price was therefore the first African American to sing with the Met, if not at the Met. That distinction went to Marian Anderson, who, on January 7, 1955, sang Ulrica in Verdi's Un ballo in maschera. In November 1954, Price made her recital debut at New York's Town Hall with a program that featured the New York premiere of Samuel Barber's cycle Hermit Songs, with the composer at the piano, and then set out on her first recital tour in the Community Concerts series for Columbia Artists. Then, the door to opera opened through live television—and the NBC Opera Theater, under music director Peter Herman Adler. In February 1955, she sang Puccini's Tosca, becoming the first African American to appear in a leading role in televised opera. Several NBC affiliates (some north of the Mason–Dixon line) canceled the broadcast in protest. Price returned in three other NBC Opera broadcasts, as Pamina in The Magic Flute (1956), Madame Lidoine in Poulenc's Dialogues of the Carmelites (1957), and Donna Anna in Don Giovanni (1960). In March 1955, she auditioned at Carnegie Hall for the Austrian conductor Herbert von Karajan, who was touring with the Berlin Philharmonic. Impressed with her singing of "Pace, pace, mio Dio" from Verdi's La forza del destino, Karajan reportedly leapt to the stage to accompany her himself. Calling her "an artist of the future," Karajan asked for permission to direct her future European career. Over the next three seasons, Price crossed the U.S. in recitals with her longtime accompanist, David Garvey. She also toured India (1956) and Australia (1957), under the auspices of the U.S. State Department. On May 3, 1957, she sang a concert performance of Aida at the May Festival in Ann Arbor, Michigan, her first public performance of what became her signature role. Her debut on the grand opera stage occurred in San Francisco on September 20, 1957, as Madame Lidoine in the U.S. premiere of the Dialogues of the Carmelites. A few weeks later, Price was called on to sing her first on-stage Aida, stepping in for Italian soprano Antonietta Stella, who had withdrawn because of appendicitis. The following May, Price made her European debut, as Aida, at the Vienna Staatsoper on May 24, 1958, at Karajan's invitation and under his baton. Debuts followed at London's Royal Opera House (replacing Anita Cerquetti), and at the Arena di Verona, both as Aida. In 1958-59, she returned to Vienna to sing Aida and her first onstage Pamina; repeated her Aida at Covent Garden; gave a televised recital with Gerald Moore and sang operatic scenes by Richard Strauss on BBC Radio; and made her debut at the Salzburg Festival in Beethoven's Missa Solemnis, under Karajan. That summer, she also sang Il trovatore in Verona (with tenor Franco Corelli) and made her first full operatic recording, of Il Trovatore, for RCA. 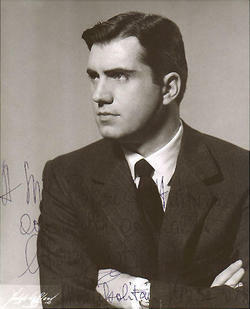 It was after hearing one of the Verona performances that Rudolf Bing, the general manager of the Metropolitan Opera, invited both Price and Corelli to make Met debuts in 1960-61. The Metropolitan Opera had invited Price to sing a pair of performances as Aida in 1958, but she turned down the offer on the advice of Peter Herman Adler, director of NBC Opera, and others, who urged her to arrive in a non-stereotypically black role. In his autobiography, William Warfield quotes Adler as saying, "Leontyne is to be a great artist. When she makes her debut at the Met, she must do it as a lady, not a slave." The reviews were less enthusiastic for Corelli, who told the Met's general manager Rudolf Bing the next morning that he would never sing with Price again. But this outburst was soon forgotten. Price and Corelli sang together often over the next dozen years, at the Met as well as in Vienna and Salzburg. In her first few weeks at the Met, Price gave four other company debut performances as Aïda, Cio-Cio-San in Madama Butterfly, Donna Anna in Don Giovanni, and Liu in Turandot. In recognition of this extraordinary run, Time magazine put her on its cover in March. That fall, she was named "Musician of the Year" by American music critics and put on the cover of "Musical America." The most important performance of Price's career was on September 16, 1966, when she sang Cleopatra in Antony and Cleopatra by American composer Samuel Barber, a new opera commissioned to open the Met's new house at Lincoln Center. The composer had written the role especially for Price, often visiting her house in Greenwich Village to test the music, including the soaring leaps into the upper register in Cleopatra's two arias. In the performances, Price's singing was highly praised, especially in the powerful death scene, but the opera as a whole was considered a failure by many critics. Director Franco Zeffirelli was blamed for burying the music under heavy costumes, huge scenery, scores of supernumeraries, and several camels. Bing acknowledged it was a mistake to launch nine new productions in the first season (three in the first week). Adding to the challenge, the opera house's new high-tech stage equipment and lighting had not been tested or fully mastered. (In the rehearsals for "Antony and Cleopatra," the expensive stage turntable broke down and, at the dress rehearsal, Price was trapped briefly inside a pyramid.) The pressured last week before the opening night, and excerpts of Price's singing, were chronicled by director Robert Drew for a Bell Telephone Hour TV documentary aired that fall. Price said the experience was traumatic and affected her attitude toward the Met, where she began to appear less often. The opera was never revived at the Met. However, with the help of Gian Carlo Menotti, Barber reworked the score for successful productions at the Juilliard School and the Spoleto Festival in Charleston, where it received praise. Barber also prepared a concert suite of Cleopatra's arias for Price, which was premiered in Washington in 1968 and recorded for RCA. In the late 1960s, Price cut back her operatic performances in favor of recitals and concerts. She was tired, frustrated with the number (and quality) of the Met's new productions, and perhaps felt the need to rework her vocal technique as she reached middle age. She became a popular artist in the orchestral and performing arts series in the major American cities and large universities. In the early 1970s, she also returned to Europe, for opera performances in Hamburg and London's Covent Garden, and gave her first recitals in Hamburg, Vienna, Paris, and the Salzburg Festival. At the latter she was a favorite, appearing in recitals in 1975, 1977, 1978, 1980, 1981, and 1984. She was frequently called on as a soloist for state occasions. In January 1973, she sang "Precious Lord, Take My Hand" and "Onward, Christian Soldiers" at the state funeral of President Lyndon B. Johnson, at whose 1965 inauguration she had sung. President Jimmy Carter invited her to sing a nationally televised recital at the White House in 1978, and she returned to sing for state dinners after the signing of the Camp David Accords and on the visit of Pope John Paul II. In October 1973, she returned to the Met to sing Madama Butterfly for the first time in a decade. In 1976, she appeared in a long-delayed new Met production of Aida, with James McCracken as Radames and Marilyn Horne as Amneris, directed by John Dexter. The next year, she renewed her partnership with Karajan in a Brahms Requiem with the Berlin Philharmonic at Carnegie Hall, and in 1977 returned to Europe for what proved her final opera performances there, in Il trovatore at the Salzburg Easter Festival and Vienna's Staatsoper, again under Karajan. The latter marked Price's and Karajan's first performances at the Staatsoper since 1964, when Karajan had quit as director (and Price had refused to return without him). In 1977, Price sang her last new role, and her first Strauss heroine, the title role of Ariadne auf Naxos, in San Francisco, to positive reviews. When she sang the opera at the Met in 1979, she was suffering from a viral infection and canceled all but the first and last of eight scheduled performances. Reviewing her first performance, the New York Times critic John Rockwell was not complimentary. In fall 1981, she had a late career triumph as Aida in San Francisco, when she stepped in for soprano Margaret Price on short notice. (Leontyne Price had not sung the role since 1976.) Columnist Herbert Caen of the San Francisco Chronicle reported that she had insisted on being paid $1 more than the tenor, Luciano Pavarotti. This would have made her, for the moment, the highest-paid opera singer in the world. The opera house denied this. In 1982, she returned to the Met in Il Trovatore, and sang a televised concert of duets and arias with Marilyn Horne. In 1983, she hosted two televised performances of "In Performance from the White House." Leontyne Price gave her operatic farewell on January 3, 1985, in a televised performance of Aida from the Met. Time Magazine described it as a "vocally stunning performance... that proved she can still capture her peak form." Donal Henahan wrote that the "57-year-old soprano took an act or two to warm to her work, but what she delivered in the Nile Scene turned out to be well worth the wait." In 2007, PBS viewers voted her singing of the aria, "O patria mia", as the No. 1 "Great Moment" in 30 years of "Live from the Met" telecasts. The performance ended with 25 minutes of applause. In October 2001, at the age of 74, Price was asked to come out of retirement to sing in a memorial concert at Carnegie Hall for the victims of the September 11 attacks. With James Levine at the piano, she sang a favorite spiritual, "This Little Light of Mine", followed by an unaccompanied "God Bless America", ending it with a bright, easy B-flat below high C.
She recorded five Prima Donna albums of operatic arias generally of roles that she never performed on stage. She also recorded two albums of Richard Strauss arias, recitals of French and German art songs, two albums of Spirituals, and a crossover disc, Right as the Rain, with André Previn. Her recordings of Barber's Hermit Songs, scenes from Antony and Cleopatra, and "Knoxville: Summer of 1915", were reissued on CD as Leontyne Price Sings Barber. Her most popular operatic aria collection is her first, the self-titled Leontyne Price, sometimes referred to as the "Blue Album" because of its light blue cover. It has been reissued on CD and SACD. In 1996, for her 70th birthday, RCA Victor issued a limited-edition 11-CD boxed collection of her recordings, with an accompanying book, entitled The Essential Leontyne Price. In addition, sunce her retirement in 1997, several archival recordings of live performances have been released on CDs. Deutsche Grammophon issued Salzburg performances of "Missa Solemnis" (1959) and Il trovatore (1962), both conducted by Karajan. In 2002, RCA released a shelved tape of her 1965 Carnegie Hall recital debut in its "Rediscovered" series. In 2005, Bridge Records brought out the complete 1953 Library of Congress recital with Barber, with the Hermit Songs, Henri Sauguet's "La Voyante", and songs by Poulenc. In August 2008, a tape of a 1952 Berlin performance of the Breen-Davis Porgy and Bess was found in the Berlin radio archives and released on CD. It offers the earliest recorded glimpse of Price's voice and style. In 2011, Sony Classics brought out on disc her Met broadcasts of Il trovatore (1961) and Tosca (1962), both with Corelli. They were followed in 2012 by anErnani (1962) with Carlo Bergonzi. From left to right, NEA Chairman Dana Gioia honors the first class of National Endowment for the Arts Opera Honorees in 2008: Price, Carlisle Floyd, Richard Gaddes. In an interview, Price once recalled that Maria Callas had told her, during a meeting with the older diva in Paris, "I hear a lot of love in your voice." The sopranos Renée Fleming, Kiri Te Kanawa, Jessye Norman, Leona Mitchell, Barbara Bonney, Sondra Radvanovsky, the mezzo-soprano Denyce Graves, bass-baritone José van Dam, and the countertenor David Daniels, have talked about Price as an early inspiration. ^ Randye Jones, "Biographies: Leontyne Price (b. 1927)", Afrocentric Voices in "Classical" Music. ^ "Price, Mary Violet Leontyne". Encyclopedia of African-American Culture and History. Encyclopedia.com. Retrieved February 21, 2011. ^ Garland, Phyl (June 1985). "Leontyne Price: Getting Out At the Top. A prima donna assoluta says goodbye to the opera, will continue as concert singer". Ebony Magazine. Retrieved February 21, 2011. ^ a b c Walsh, Michael; Newman, Nancy (January 14, 1985). "Music: What Price Glory, Leontyne!". Time Magazine. Retrieved February 21, 2011. ^ a b Henahan, Donal (January 4, 1985). "Opera: Leontyne Price's Final Stage Performance". The New York Times. Retrieved February 2, 2011. ^ "Spingarn Medal winners: 1915 to today" Archived 2010-07-07 at the Wayback Machine, NAACP. Retrieved September 18, 2012. ^ "Time Magazine, Milestones, May 21, 1973". Time. May 21, 1973. Retrieved December 5, 2013. ^ "A New Star at Covent Garden", The Times, July 3, 1958, p. 5, column D.
^ Portraits of the American Stage. Washington: Smithsonian Institution Press. 1971. p. 178. To her also went what many consider the outstanding operatic honor of this century – the privilege of opening the new Metropolitan Opera House in New York's Lincoln Center in a role written especially for her. On 16 September 1966 the curtains of the new house parted on a grandiose production of her old friend Samuel Barber's Antony and Cleopatra with Justino Diaz and Leontyne Price in the title roles. ^ Rockwell, John (February 19, 1979). "Opera: Met's 'Ariadne' Finally Comes to Stage". The New York Times. Retrieved December 5, 2013. ^ Great Performances – Great Moments at the Met: Viewer's Choice Archived 2012-06-30 at the Wayback Machine. KQED. Transcript. Aired Saturday, December 26, 2009. Retrieved February 21, 2011. ^ Story, "And So I Sing," p. 114. ^ Miles Davis, Quincy Troupe, Miles: The Autobiography, Simon & Schuster, 1990. Pages displayed by permission of Simon & Schuster. 2005. Retrieved March 15, 2011. ^ BBC Music Magazine press release, March 13, 2007. LaBlanc, Michael L. LaBlanc, (1992). Contemporary Black biography. profiles from the international Black community. Detroit, Mich.: Gale Research Inc. ISBN 9781414435299. Lyon, Hugh Lee (2006). Leontyne Price: Highlights of a Prima Donna. New York: Authors Choice Press. J. B. Steane, The Grand Tradition: Seventy Years of Singing on Record (Timber Press, 1993). Rosalyn M. Story, "And So I Sing:"African American Divas of Opera and Concert" (Amistad, 1990). Ward Plowden, Martha (2002). Famous Firsts of Black Women (2nd ed.). Gretna, La. : Pelican Pub. Co. ISBN 1565541979. "From Collard Greens to Caviar: Leontyne Price Reminisces", Opera News, July and August 1985. Wikimedia Commons has media related to Leontyne Price.